Koi Carp all come under the species Cyprinus capio, but there are many different Koi carp varieties. The variety names are japanese and are words that describe the colour, pattern or scales of each group. We’ve put together the most popular varieties below. First bred as far back as 1888 the Kohaku was one of the first varieties developed and still today is considered the most important. Koi originate from the common carp. 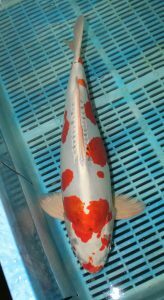 Kohaku are a white Koi with red markings and perhaps the best known and most popular variety. They can be Doitsu (scaleless), plain or Gin Rin. The beauty of the Kohaku is there is so many different patterns the red can take that there is always a Kohaku everyone likes. The red is called Hi and has good crisp edges. Tancho is a pure white koi with a circular red spot in the centre of its head, one of the most sought after varieties. The word Sanke means tri-colour. It is not known exactly when the first sanke was bred but they were first recorded between 1912 and 1926. They have changed dramatically over the years from having a striped appearance to the many patterns found today. One of the most popular varieties, the Sanke has a wide variety of patterns. 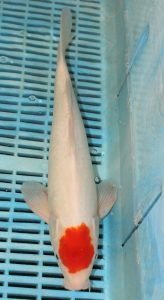 A white fish with red (hi) and black (sumi) markings. 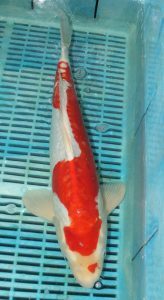 The Showa is the last of the traditional ‘big 3’ koi varieties, known as ‘Go Sanke’, Kohaku and Sanke being the other two. A young variety compared to many. 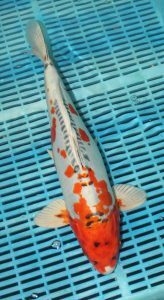 It was first produced by Jukichi Hoshino back in 1927 when he attemped to cross a yellow and black koi (Ki Utsuri) with a Kohaku (red and white). The variety was gradually improved by more cross breeding until the Showa we know today was produced in the 1960’s. 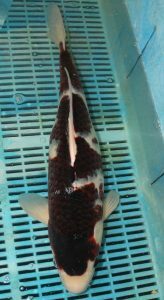 A Showa is predominantly a black fish with red and white markings as opposed to the Sanke which is basically a white fish with red and black markings. A lot of Koi keepers have trouble telling the difference between the two. Generally they will have much more black than Sanke’s. The head usually has black and the pectorial fins will have black, this is called ‘Motoguru’. There is traditionally two types, a Hi Showa, this is a mainly black with red markings all down the body. The second is a Kindai Showa, this is considered more modern and has a lot more white on the body. The Tancho with it’s red spot on the head is a much sought after fish. There are very few good quality high grade fish available. 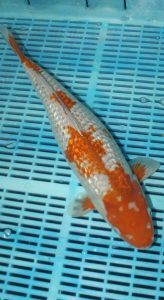 There are different varieties the Kohaku, Sanke and Showa, all have one distinguishing feature a red mark on the head. The Hi should be deep red and the rest of the fish pure white. There should be no other Hi on the body. The hi Markings should only be on the head and the rest of the body black and white. The body has the pattern of black and white similar to the shiro utsuri with the red hi marking on the head. The Hi marking should be on the centre of the head and should not cover the eyes. Traditionally a perfect round spot was deemed the most desirable but hobbyists are now looking for other shapes such as a diamond, heart, oval etc. Shusui are a firm favourite with most Koi enthusiasts. The striking blue and red colours make it a must for most Koi collections. First produced in 1910 when a Asagi Sanke was crossed with a Doitsu Mirror Carp. The scales along the dorsal and lateral lines should be neatly aligned, an important part of a its value. The blue on the body should cover the length of the body and be an even shade. All blue shusui were very popular but today Hana Shusui are more in demand. The hi markings between the abdomen and the lateral line contrasting with the blue make this a must have addition. Unfortunately as they get older, particularly in hard cold water they have a tendency to go dark. Not a popular fish in Japan but as with many koi carp varieties, very good quality fish are being produced by Maagan in Israel. 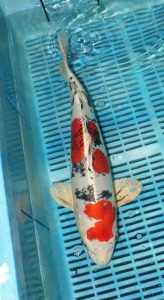 Asagi Koi are one of the oldest breeds of Koi and now one of the most popular. First bred as far back as 1888 the Asagi was one of the first varieties developed and is still bred in high numbers across the world today. The Asagi can be recognised by its shade of blue as soon as you see it. Asagi is actually the Japanese word for indigo or pale blue. 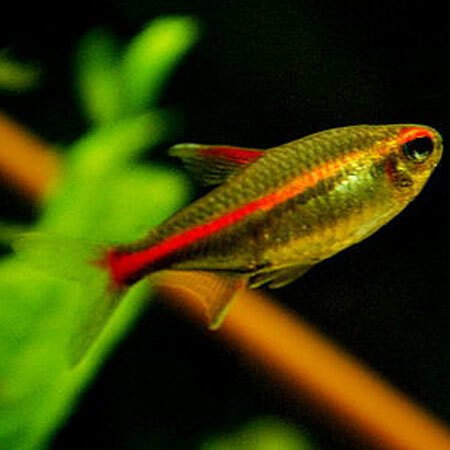 They have a grey head and often have red (or Hi) on there fins and belly. This Koi has the ability to grow very large which always makes them popular with Koi keepers. Whilst one of the simpler varieties at first glance, as you look close the net pattern on the back is complex and stunning when of a good grade. High grade examples will offer an even and defined pattern throughout the body. Any red found will also be as symmetrical as possible. 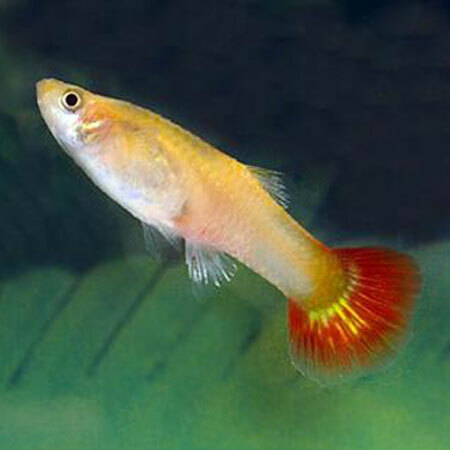 Often mistaken for Utsuri, Bekko are a white, red or yellow koi with markings over the body. Although bred in all three colours, usually it is just the White and Black variety available to purchase. The Shiro is white with black markings, the markings should be evenly spread across the body. The Aka is red with black markings. The Ki is yellow with black markings. A stunning and popular Koi, many people struggle to tell the difference between this and the Utsuri. The Bekko is a white Koi with black markings whilst the Utsuri is a black Koi with white markings. When bred to a high grade, the white is like snow and the black dark like ink with crisp sharp lines. Whilst bred all across the world, Israel is now leading the way, producing some fantastic fish, as a result this is where Aquatics To Your Door purchases all it’s Bekko. In addition to the standard scaling, it is also bred Doitsu and Gin Rin too. 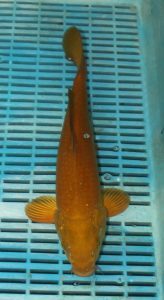 Utsurimono are often confused with the Bekko varieties due to their similar colouration. The difference between them is that Utsuri are black Koi with red, white or yellow markings. Whereas Bekko are white koi with black or yellow markings. Unlike the Bekko they also have sumi markings on the head which reaches down to the nose. 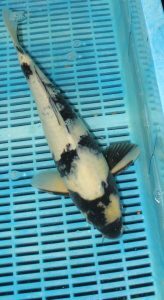 The Shiro Utsuri is a black Koi with white markings. It is desirable for the sumi to be jet black and the white to be pure. The cleaner the white the better. 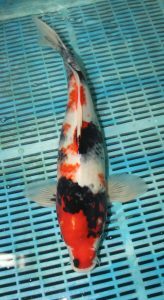 The Hi Utsuri is a black Koi with red markings. The Hi should be uniform in shade. This can be difficult to find as the red on the head is often darker. The Ki Utsuri is a black Koi with yellow markings. Finding good quality fish is difficult as not as many are produced. With all varieties there should be solid sumi in the base of each fin. The history of utsurimono is not very clear. It is known that black koi with yellow markings were around about 1870-75 and were called kuro-ki-han. They were renamed Ki in 1920 by Eizaburo Hoshino. Shiro Utsuri were first produced around 1925 and it is believed they are of Magoi lineage. Good quality Utsuri are not as readily available as many other varieties but they make a striking addition to any collection. 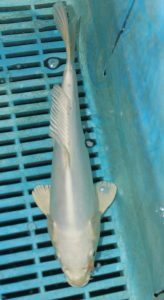 Yamatonishiki are produced by breeding sanke with platinum ogon. It is a metallic Koi with red and black markings, basically a metallic sanke. When choosing your Koi, as with a normal sanke you should look for a balanced pattern on each side of the body. Your fish should have deep red Hi and deep Sumi (Black) markings with a pure white metallic body. In comparison to other varieties such as Kohaku and Sanke, very few Yamatonishiki are produced. Yamatonishiki make a stunning addition to any koi collection. Not many are produced in Japan. Fortunately Maagan Michael in Israel ever aware of the European appreciation of this variety are producing a reasonable number. We always stock these when available. The Chagoi is the friendliest of all the Koi Varieties. A shade of brown it is not usually bought for it’s colour but rather it’s personality. Koi buyers add this Koi to their pond to try to tame the other koi. They are the first Koi to try hand feeding and so encourage the other Koi to the top of the water. Other Friendly varieties are the Ochiba and Soragoi. Ochiba are a cross breed of the Chagoi and Soragoi . Soragoi are a solid grey colour. All of these Koi will show similar attitudes to the Chagoi. Available in Gin Rin and Doitsu as well as the standard scaled variety. Some are bred to a chocolate brown colour but they are also know in an Olive green colour. Both of which are very popular. Ochiba Shigure translates as Autumn leaves on the water. They are a cross breed of the Chagoi and Soragoi. Soragoi are a solid grey colour and Chagoi a shade of brown. The ochiba is blue/grey with a brown pattern. These Koi are bought for their personality. They are the first Koi to try hand feeding and so encourage the other Koi to the top of the water. The Soragoi is a single coloured grey- blue non metallic koi. It is a very fast growing variety. A clean head and good quality scale pattern are essential in this variety. The friendly disposition of Chagoi are also found with Soragoi. With patience you can get them to hand feed. As well as the fully scaled variety you can get doitsu and gin rin varieties. The colour of these fish can range from light to dark blue grey. They are closely related to wild carp and as such can grow to over 30” in length. This close relation with wild carp is the reason for their friendly disposition which is increased as the fish grows. When crossed with Chargoi they produce Ochiba. The mix of the chocolate brown of the Chagoi and the blue grey of the Soragoi can be very striking. The Goromo is originally a cross between the Kohaku and Asgai. Today however it is a stand alone variety which continues to grow in popularity every year. 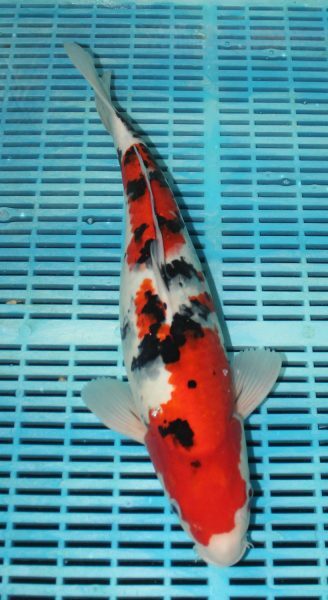 With the complexity of a Kohaku’s markings and the scale pattern from the Asagi it makes this a very interesting Koi. A purple grape colour makes this Koi unique and a great addition to any pond. 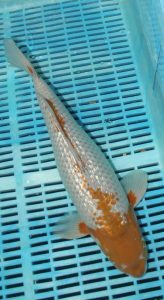 When selecting a Goromo a lot of the same criteria applies as the Kohaku.You are looking for a good clean white base with an even pattern across the fish. Often a deep purple colour, thus there is nothing else quite like it. Over the past 10 years Israel have become the masters of breeding Goromo. As a result every one you see here at Aquatics To Your Door will have been selected in Israel. 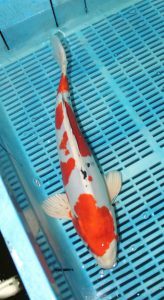 The Israeli Koi are both of high quality but also tough and used to English conditions. For sale from 2-3 inches all the way up to 20 inches, we have one for everyone! 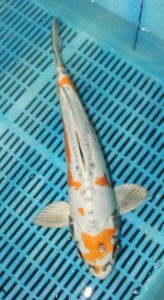 A truly stunning Koi the Goshiki is being bred more and more in recent years and as a result, higher grade examples are being made available in the UK market. In the past these fish were quite rare in Japan. Maagan in Israel have fortunately over the last few years been producing a good quantity of high grade fish. Newcomers to the hobby might not appreciate how difficult it once was to obtain this variety. When purchasing you should be looking for a good spread of red, similar to a Sanke, also a nice clean distinction between the colours is ideal. 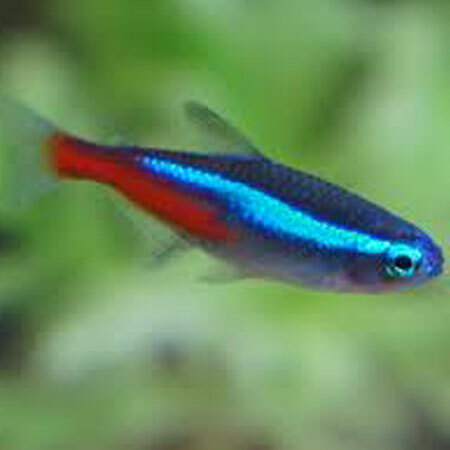 Here at Aquatics To Your Door we have Goshiki available from 4 inches all the way up to 20 inches. They also come in four categories- Doitsu, fully scaled, matsuba and doitsu matsuba. 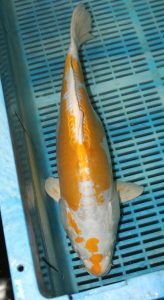 Yamabuki hariwake are a silver koi with metallic yellow markings. On the fully scaled and doitsu variety the yellow should be balanced over the body.The edges of scales should be defined. 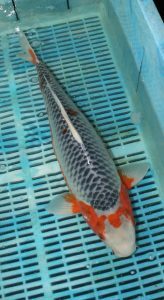 Orenji hariwake are the same silver koi but with orange markings. These should be balanced over the body and be deep and metallic. The Hariwake matsuba is a silver yellow koi with matsuba pattern of sumi in each of its scales. Although both yamabuki and orenji are popular it is the doitsu yamabuki which are the most sought after due to the beautiful metallic lustre of their skin. Kikokuryu is the name given to many Koi. 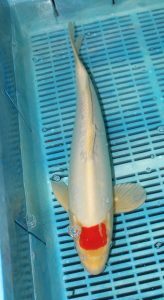 There are many types of Kikokuryu depending on the country of origin, breeder, the fish used to cross breed them and the mixture of genetics. There is the standard white black metallic look. This originated from the crossing of Kumonryu with platinum Koi. 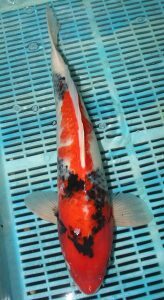 The more popular is the doitsu white koi with orange or even red markings (sumi) on the body sometimes with black edging around them. The markings come in many different patterns. It’s desirable to have markings throughout the length of the body.The scales along the dorsal fin should be neatly aligned. 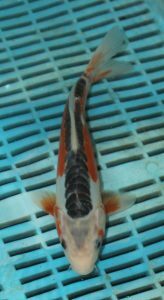 A good quality koi will have good skin luster, metallic sheen. The Kiwa (edges) of each colour should have crisp edges all the way round. Kikokuryu often grow very large and it is not unusual for them to grow to 30″. Kujaku are platinum koi with Hi markings that cover a large proportion of the body. The scales are overlaid with a black pine cone pattern (matsuba). The most sought after are the ones with red heads with no black markings. Kujaku were first produced in 1960 in Ojiya by Toshio Hirasawa. They were bred from matsuba shusui and hariwake. Along with the fully scaled fish many of the fish are doitsu. 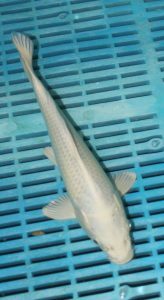 This platinum koi should have hi markings over it’s body and sumi markings only in the scales along the lateral lines and dorsal fin. 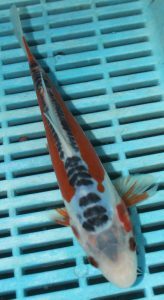 Very occasionally you can come across a beni kujaku with hi markings all over the body, a rare but beautiful fish. The scaled variety are generally considered to be more impressive. Kumonryu are a black doitsu fish with white markings on the head and fins. This contrast of black and white makes it a very popular sort out fish. Translated it means ‘Dragon Fish’. Until recently it was difficult to obtain good quality specimens as very few were available from Japan. Recent breeding by Magaan in Israel has produced good quality fish in reasonable numbers. 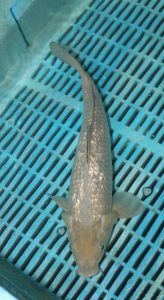 Maagan are also producing Beni Kumonryu, black and white fish with red markings. The big drawback with these beautiful fish is unfortunately at times these fish can turn completely white or black. Although there is a risk of this happening we feel the rewards of owning one of these stunning Koi out ways the risk. Having spent many days in the past touring Japan trying to obtain these fish it is very rewarding to now find Kumonryu readily available. A single coloured fish with a pine cone pattern in the scales on the back. Shiro Matsuba- A white koi with a black pine cone pattern in the scales. Aka Matsuba- This is a red koi with black markings in the scales. Ki Matsuba- A yellow based Koi with black markings in the scales. There are usually very few good quality specimens available. Poor quality koi are considered by many as ghost koi. They have long been considered the poor relation in comparison to other varieties. But while on a koi buying trip David saw two 20″ Shiro matsuba which were absolutely magnificent high quality koi carp. They might be rare to find but are worth a place in your collection. The name Kikusui literally means ‘water chrysanthemum’. The Kikusui is a doitsu platinum Koi. The head should be platinum and along each side there should be a deep wavy line of vibrant orange or red. You need to look for a nice pattern with sharp edges, in contrast to a very white satin skin. When looking at this variety people often remark it looks as if it has been painted, this is a truly stunning fish. The Ogon is one of the most popular varieties of Koi Carp. Usually Silver or Gold in colour, they are single coloured metallic Koi. The colour should be the same hue all over with no markings. Platinum Koi- A metallic white koi, sometime referred to as ‘Purachina’. Yamabuki- A yellow-gold Koi carp. 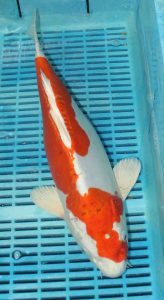 Orenji Ogon- A Metallic Orange Koi Carp. Ogons are generally easy to come by as due to their popularity they are now bred in large numbers. In 1921 Sawata Aoki took a Koi with gold stripes and bred from it. After 5 generations of breeding with the koi with the most gold colouring the following varieties were developed- Gin Kabuto, Kin Kabuto, Kinbo and Ginbo. Gin Kabuto/Kin Kabuto are black koi with scales that have silver or gold edges. Kinbo/Ginbo are black koi with a metallic sheen of gold or silver. 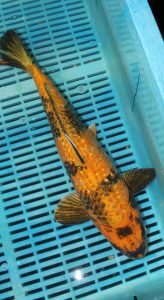 In 1946 two Gold Koi were produced. This entry was posted in Information and tagged Chagoi, hariwake, Hi Utsuri, Kikusui, kohaku, Kujaku, Kumonryu, ochiba, ogon, Sanke, Shiro ursuri, Showa, Shusui, Soragoi, Yamatonishiki.